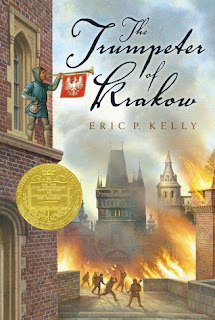 The Trumpeter of Krakow by Eric P. Kelly is available at Amazon, Barnes and Noble, and BooksAMillion but don't forget to check for a copy at your local library. There was somthing about the Great Tarnov Crystal....Wise men spoke of it in hushed tones. Others were ready to kill for it. Now a murderous Tartar chief is bent on possessing it. But young Joseph Charnetski was bound by an ancient oath to protect the jewel at all costs. I'm starting to wonder if those early Newbery judges liked to torture kids? This 1929 Newbery Award Winner was difficult for me to read, for a multitude of reasons. Let me start with the depiction of women. Kelly didn't even bother to name the mother of his main character, Joseph, even though "Mother" often appears on the scene. Both "Mother" and her son's love interest, Elzbietka, relay the idea that females need to be cared for by men and need to be told what to do. Ugh. Spare me the medieval BS - it's not romantic and it stinks to high-heaven. I don't care how historically accurate it is or not - this is exactly the kind of romance we shouldn't encourage among modern children. Readers are thrown into a time and place with little background set-up; readers are expected to know the history of the region (Eastern Europe/Eurasia). This history isn't taught in the American education system - outside of WWII and Nazis, we get almost nothing about this area of the world in our history lessons. Kelly missed an opportunity to relay some of that historical information in this story. Not being well-versed in Polish history, I can't tell you how much actual history makes it into this book. The little bit that is given feels more like anecdotes intended to build up Polish/Slavic/Krakow nationalism instead of real history based on facts. There's a wishy-washy sentimentalism toward the feudal state and kingship of the Slavs with the tribal "Tartars" (Tatars/Mongols) viewed as little more than savages. This feud between the Slavs and Tartars is never fully explained; readers are just told that the two cultures have clashed for a long time - don't bother asking why questions, they won't be answered. Depictions of these two clashing cultures are one-sided, favoring the Slavs with a negative attitude toward the Tartars. This creates weak characters; the good guys and bad guys are so obviously good or bad that the story lacks the element of surprise. Kelly consistently missed the opportunity to use the element of surprise. Even when I was a kid and heard this story read out-loud, I knew what to expect later in the book because too much information is told up-front. Kelly spelled out what readers could expect in lengthy descriptions of his characters and setting. Formulaic is the word that comes to mind. It doesn't matter what age you are, being able to figure out what's going to happen so easily makes any story bland. Every time I've read this book, I've always been glad to reach the end so I can move on to something better.